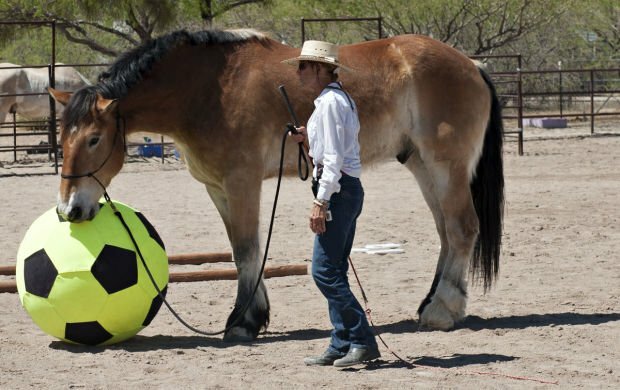 Carol Grubb runs through Gulliver’s training routine during Equine Voices Rescue & Sanctuary’s 10th annual fundraiser at Brandi Fenton Memorial Park, 3482 E. River Road. Gulliver was rescued by group founder and president Karen Pomroy when he was 11 months old and serves as the sanctuary’s mascot. 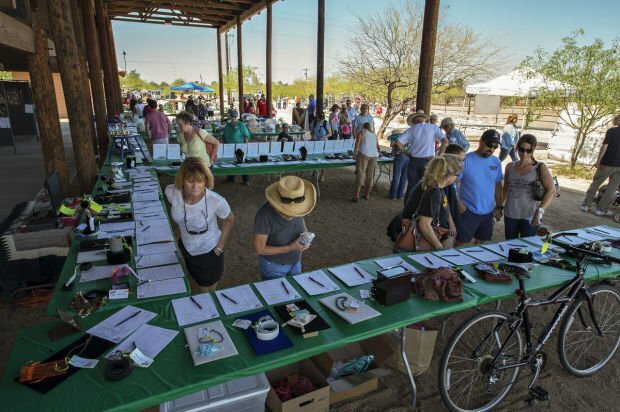 More than 200 hundred items such as jewelry and crafts are ready to be auctioned off during Equine Voices Rescue & Sanctuary’s fundraiser at Brandi Fenton Memorial Park. Stella Inger gives the crowd background history on several rescued horses. Inger, special guest for the event on Saturday, is a television news anchor for KGUN 9. The Amber Norgaard Band performs at the fundraiser. Norgaard was joined by Jay Trapp on bass, Mike Troupe on drums, and Doug Floyd on guitar at the event Saturday. Trainer Carol Grubb and 11-year old Gulliver perform for the crowd at Equine Voices Rescue & Sanctuary's 10th Annual Fundraiser at Brandi Fenton Equestrian Park at 3482 E. River Road on March 29, 2014 in Tucson, Ariz. Along with the silent auction, raffle and tack sale, the fundraiser also featured the music from the Amber Norgaard band and food from Lovin' Spoonfuls and Tommy DiMaggio's On the Road Cafe. Eegee's was also on hand with frozen fruit slushes. Equine Voices Rescue & Sanctuary, founded by Karen Pomroy in 2004, is a non-profit organization dedicated to rescuing Premarin mares and foals from slaughter and neglect. The group hosts volunteer and adoption programs, youth education programs, and horsemanship seminars. Volunteers are sought for administrative help, public relations, grant writing and general horse care at the ranch. Dozens of horses and burros at the group's sanctuary can be seen, adopted, and sponsored at http://www.equinevoices.org.